Please click here to view hotel website. 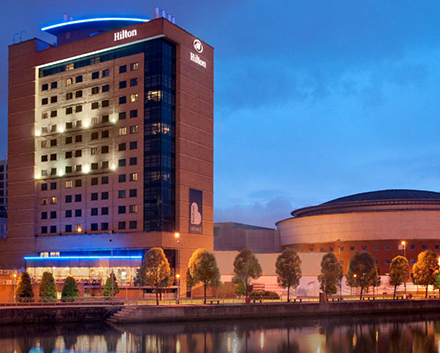 The Hilton Belfast is located in the heart of the city next the Belfast Waterfront and within walking distance of the Victoria Square, Cathedral Quarter and City Hall. By bus, take the Airport Express from outside the terminal and alight at Europa Bus Station. Exit bus station turning left onto Great Victoria Street, take first right onto Howard Street down to May Street. This takes you to Lanyon Place.